Caps that are presented to individuals or teams to commemorate, mark a special occasion or reward a special achievement. Historically issued in sports, an honours cap is considered a highly valued item by its holder. This website has been created to be a community for sharing photographs and information about all types of historical sporting honours caps, which should allow us to create an informative resource. 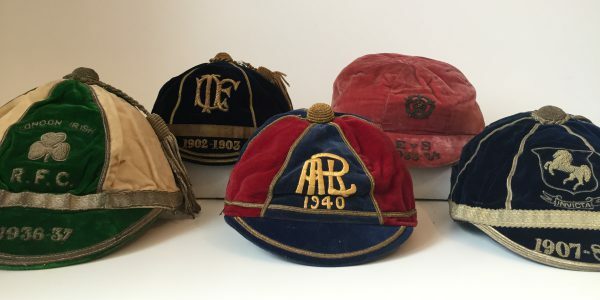 From the private memorabilia collectors, sporting organisations and museum curators, to the person finding a one off cap at the back of their attic. From School and College sporting teams and a sports infancy, to Professional, Regional and International representation. Please share as much information as you can, comment and correct when you can, to help make this website become a valuable tool for us all. This is just the beginning and I hope that the pages will continue to grow in size and number. I have done my best to categorise, and where necessary identify, but this isn’t always a simple task. Use the search bar at the bottom of the page for specific searches or click on the drop down menus at your leisure. Click on any picture to enlarge them and to view or add comments. I hope we can make this an important source for preserving the heritage, collating and sharing our knowledge, and in doing so help us all create a useful historical record to allow these items to live on.